Mosaic is a rapidly growing provider of consumer financing for the modern home. We empower contractors with the option to offer their customers financing for home improvement projects. The net gain is a win-win for both the contractor and the customer. 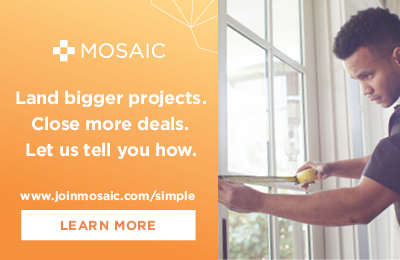 Mosaic makes financing home improvement easy and affordable for homeowners with the simplest borrower experience available. As the market leader in solar lending, Mosaic has originated more than $2 billion in loans to date and works directly with leading home energy companies and contractors to make solar, high-efficient windows, doors, HVAC, and roofing accessible to all. Mosaic has been honored by Fast Company as a Top Ten Most Innovative Company in Energy for two consecutive years. For more information, visit http://joinmosaic.com.